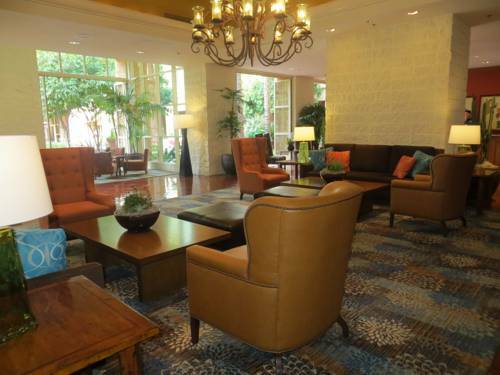 Tempe Mission Palms Hotel boasts the climate of Arizona and the charm of Tempe- Phoenix delightful next-door neighbor. Guests can walk to more than 170 unique shops galleries and restaurants. Nearby is the famed ASU-Karsten Golf Course designed by Pete Dye. The hotel is an IACC certified conference center offering 30000 square feet of multi-functional space. The 303 rooms and suites feature attractive furnishings and efficient workspace complete with high-speed wireless internet and 37 inch flat screen televisions. The Tempe Mission Palms is a smoke-free facility. Mission Grille: Guests will enjoy our unique take on traditional American fare or one of our creative southwestern style dishes such as Breakfast Enchiladas or Ancho Chile Pasta. Harrys Place Bar: Featuring local farms and purveyors the menu highlights American dishes with a unique southwestern flair. Terrace Cabana: The perfect downtown Tempe bar to enjoy the Arizona sun and sip on a specialty cocktail the poolside Cabana Bar and Grill serves casual fare and features a full bar. CAFE BOA BISTRO AND WINE BAR: Caffe Boa on Mill Avenue has a romantic atmosphere great service and a selection of Italian food and wine.